Review posted March 12, 2018. Viking (Penguin Young Readers Group), 2017. 44 pages. This is a really interesting story about an explorer I’d never heard of – Percy Fawcett – who searched for a lost city in the Amazon, and never returned. But he had an interesting, successful, and adventurous life before his final expedition. He was born in 1867 in Devon, England. His father was a fellow of the Royal Geographical Society, and his older brother was a mountain climber and author of adventure novels. Adventure ran in the Fawcett family blood. He served in the military before he got to devote full time to exploring, but that’s what he went on to do. The book tells about his preparation and training, as well the legends of an ancient city deep in the Amazon rain forest. 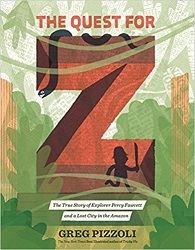 When British explorer Percy Fawcett heard these legends, he called the mythical city “Z.” Maybe he chose this name because the lost city seemed to be the most remote place in the world, the final stop, like the last letter of the alphabet. He made finding Z his life’s work. There’s a map listing the expeditions he made between 1906 and 1924. (Though it’s rather hard to read – the colors of the routes look very much alike.) The book tells about some of his many adventures with giant snakes and hostile natives. I like the story where they stopped an attack by singing a medley of British songs together, accompanied by accordion. They made friends with that group of natives. The majority of his expeditions were for surveying – to map some of the most dangerous areas of the Amazon rain forest. But he always listened for rumors of the lost city deep in the jungle. When he finally set off to find the city, the Royal Geographic Society wouldn’t fund his expedition – so he got newspapers to do it. On his journey, he wrote about every step of the trip and sent out “runners” to bring the story to the newspapers as it happened. But after a month on the trail, the stories stopped, and Percy Fawcett was never seen again. There’s an interesting section of the book on the aftermath of the expedition. In the nearly one hundred years since Percy, Jack, and Raleigh went missing, treasure hunters, fame-seekers, and even movie stars have gone into the jungle to find out what happened to Percy Fawcett. None have been successful. It’s estimated that as many as one hundred people have disappeared or died in the hunt for Percy Fawcett and the blank spot on the globe that he called Z. This is a fun book. The pictures are cartoon-like, but include some helpful diagrams and drawings. They fill the pages, so that they aren’t too heavy on text, and kids won’t find the story too intimidating. It’s a fascinating story of a man who is relatively unknown now, but was a famous celebrity in his day – though unfortunately more famous for his failure than for his many successes.